Since 2015, Italian newspapers, political actors, and humanitarian representatives often have used the expression “the funnel effect of immigration” to describe the drastic increase in numbers of people arriving in Italy from Northern and sub-Saharan Africa, turning the peninsula into the main gateway to Europe and a place where people often get stuck waiting for documents to be issued. This expression also points to the contradictions at the heart of current European Union decisions about how to manage the increased numbers of incoming foreigners. While fostering liberal inclusion and multiculturalism, various EU member states advocate for stricter border control by not accepting any quota of migrants. In this context, the Italian government and civil society have played a frontline role in managing the so called “refugee crisis” in the Mediterranean. According to the International Organization for Migration (IOM), since the beginning of 2017, 103,175 people have crossed the Mediterranean into Europe; of those, 86,121 have landed on Italian shores, and the rest at Greek (9,723), Spanish (6,973), and Cypriote ports (358) (IOM 2017). The discrepancy in numbers is partly due to the closure of French and Spanish ports and of some European countries’ borders. Italy remains the easiest entry point into the continent both for its geopolitical position and for its immigration laws. Moreover, according to the Dublin III Regulation (2014), an undocumented person entering Europe must apply for asylum or humanitarian protection in the country of first arrival. Once people arrive in Italy, they must apply for legal status and go through the bureaucratic phases leading to obtaining a visa. The Italian asylum process, often stretched out by appeals, can take more than two years, thus creating a clog in the various institutional structures aimed at receiving and maintaining asylum seekers. In the summer of 2016, I joined a group of doctors from an Italian humanitarian NGO who, among other services, provide primary care in Sicily to people rescued at sea. On an early morning in July, I left Siracusa with the NGO team to drive to the commercial port where their mobile clinic was stationed. They had called me late the night before saying: “Domani c’è sbarco, incontriamoci presto” (Tomorrow there is a disembarkation, let us meet early). We drove half an hour to reach the entrance of the port, where two policemen checked our badges. The team was composed of two doctors, a nurse, a psychologist, a cultural mediator, and a freelance photojournalist documenting procedures at the port. The morning sun was unforgiving. 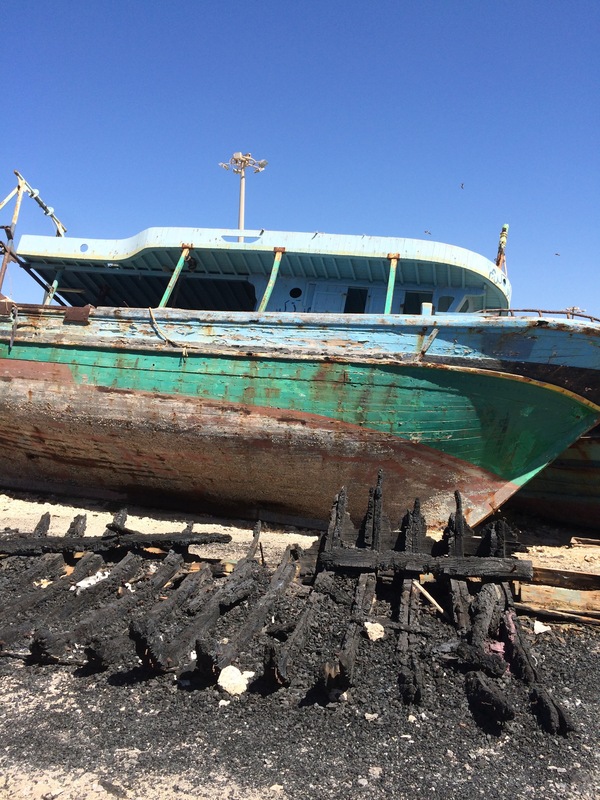 When we arrived, the mercantile boat that had rescued several rickety boats at sea the night before was already there. Those rescued sat on the boat, out in the sun. We stood on the quay waiting for the disembarkation process to start for nearly four hours. Rumors placed 600 people on the boat; we later learned from a Cameroonian man among them that six small boats had been rescued the night before. From where I stood, I could observe the standard procedures of disembarkation—or what local actors call sbarco. The doctors of the USMAF (Ufficio della Salute Marittima Aerea e di Frontiera, or Health Ministry Office of Areal and Borders Maritime Health), dressed in white uniforms and wearing masks over their mouths, were on the boat conducting a first round of medical triage, making sure no one needed immediate attention. On the quay, waiting for people to disembark, were members of governmental organizations (the Local Health Care Agency – ASL, the Immigration Office, Protezione Civile), international agencies (UNHCR, Save the Children, Terres des Hommes, Unicef, IOM, the Red Cross), local NGOs, police forces (Carabinieri, Coast Guard, Frontex, municipal police), TV and radio channels, and newspapers. People finally started to get off the boat in one line, one by one. As soon as they touched the ground, they were asked to take their shoes off and they were given a pair of fake crocs. Crocs of all eye-catching colors: orange, green, red, blue, pink. The man handing them out was shouting the shoe size as he saw the next person in line approaching from a distance: “46!” “43!” I was standing right behind him. He turned to me, and proudly said: “I know all their shoe sizes! I have done this for 3 years and got used to guessing!” People also wore an orange bracelet with a number that was assigned to them at sea, right after being rescued. The boat was full of African men, a small number of families and African women, and many young boys, presumably minors. They disembarked the men first, the rest later, to keep them out of the sun, we guessed. After disembarking, people were asked to form a line and, one by one, to go through another medical triage under the Red Cross tent. They were then asked to sit on the ground on the quay until everyone was disembarked, forming a rectangle, encircled by policemen who kept the group in place. 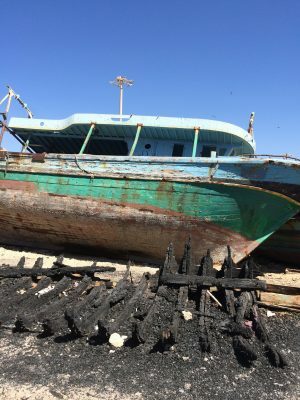 Once disembarkation was over, everybody stood up and marched outside the protected area of the port passing through the narrow gate that separates it from where all the organizations and institutions had their tents. Everyone was asked to sit on the ground forming another rectangle in front of the Immigration Office stand. People were identified by giving their name, date of birth, and nationality; they were photographed and finger printed. At this point, everyone was given another number on a piece of paper. They were now channeled to the big tents where camp beds were lined one next to the other, and people could rest. At around 1 p.m., volunteers from local NGOs pushed supermarket carts overflowing with small white plastic lunch bags near the tents. Lunch consisted in one apple, a cheese sandwich, and water. People took showers; soap, shampoo, and some clean clothes were distributed. Some did laundry and hung their clothes at the tents or on the fences surrounding the port. After lunch, UNHCR officials gathered small groups under the tents to discuss the different laws and procedures to apply for asylum or other statuses. Those who needed medical assistance went to the NGO clinic; those in critical conditions were transferred to the nearest hospital. In the late afternoon, people formed a long line in front of a supermarket cart, and another food bag was distributed with the same meal for dinner. Even as it plays host to these formal procedures of sbarco, the port itself is not just a physical site of reception, identification, care, and control. It is, in the words of one of the doctors, a “non-place” which marks a line of demarcation between the sea and the land, international and national borders, lawlessness and legality. It is a physical harbor that operates as a set of practices that different actors refer to as sbarco, but it also occupies an imaginary line between friend and enemy, the familiar and the stranger. In Italian, the word porto (port) shares the same root with the word porta (door); it refers to a passage through which people and objects move, crossing a blurred zone of categorization. In this context, the sbarco comes to signify a complex and layered process of medical, bureaucratic, legal, military, and humanitarian screening and evaluation. It involves numerous actors and institutions, and it offers a very compartmentalized approach to reception. There was something literal about the port functioning as a funnel that channels bodies through various phases of identification and recognition (Giordano 2014) and regulates the flows of people, stories, fingerprints, numbers, and documents. While the sbarco provides a space of governmental and humanitarian surveillance that moves people through techniques of care and control, it also allows for undetected practices to occur. Some people refuse to be fingerprinted, or find ways to escape from the port and go off the radar of institutional gazes; others get identified at the port, are transported to shelters, and disappear shortly after to travel north. I was struck by how well the figure of the funnel describes a spatial configuration of bodies moving through narrow zones of identification to be inserted into the register of the law. Yet this figure only partially captures the complexity of the sbarco. In the non-place of the port, the sbarco also presents the opportunity to pass through the fence that separates the port from the fields and to go unnoticed, undocumented, and undetected. Many of the people entering Europe under the paradigm of humanitarian emergency become part of a growing unrecognized workforce in the seasonal agricultural industry throughout Italy. They enter into a parallel lawless system of exploitation, which also provides shelter from the inquisitive gaze of the state. As a chokepoint—rather than a funnel—the sbarco simultaneously enables forms of legal identification that can lead to papers and access to rights, and forms of escape into alternative undocumented forms of life. Later that summer, my friends and collaborators Ramzi, a Tunisian artist and social worker, and Antonino, an Italian retired coast guard, invited me to join them to the old port of Porto Palo an hour from Siracusa. They wanted to show me where many of the rickety vessels used to cross the Mediterranean that had been confiscated by the state ended up—a cemetery of boats. 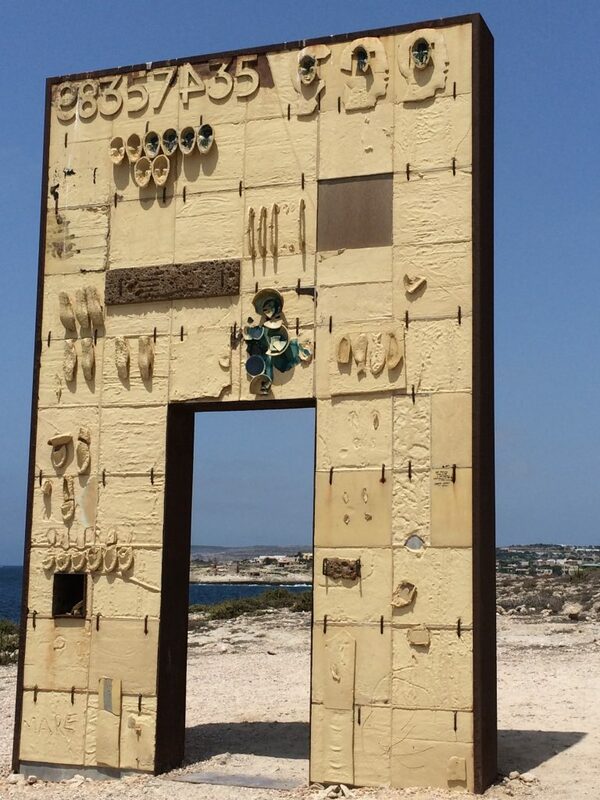 In the early 1990s, people fleeing Africa and the Maghreb used to arrive directly at small ports like Porto Palo. There were no bureaucratic or medical procedures to follow. As Antonino explained, people in the village would come out and open the ovens to bake bread and other goodies for the newcomers. All the identification processes happened at police offices and hospitals. On that windy morning, we went hunting for the objects and fragments of boats abandoned at the cemetery. Many material things cross the sea with humans and sneak onto the shores of Europe, otherwise leaking out of the screening procedures of the sbarco. 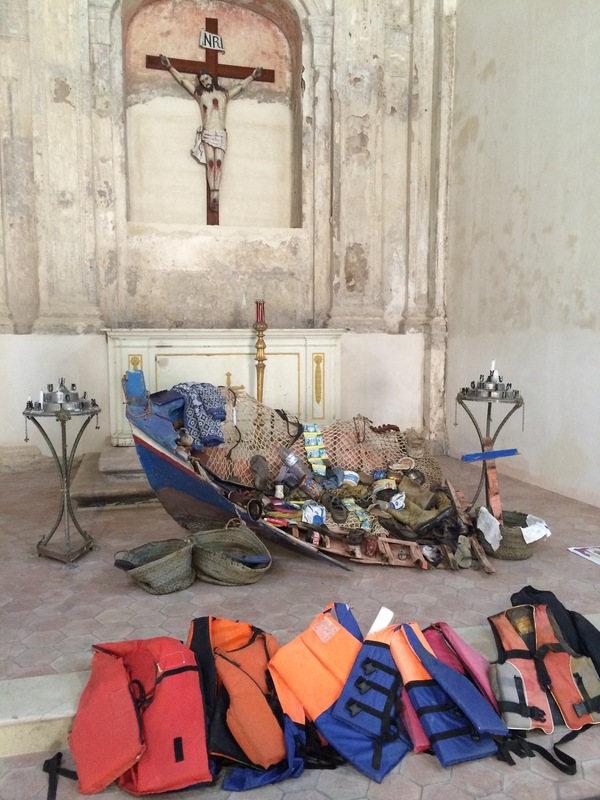 Ramzi had been collecting objects that once belonged to those who crossed, organizing them into an art installation in an empty, deconsecrated Church in Ortigia, the old part of Siracusa. Entitled “Uprooted,” the exhibit displayed artwork by various local artists related to movement and borders. His installation, “Museo dei sogni frantumati” (Museum of the fractured dreams), was made of shoes, belts, hats, water bottles, photos, books, empty cans, faded documents, backpacks, etc.—all objects recovered from ports, on beaches, and at boat cemeteries. 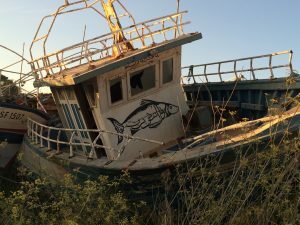 He also collected remnants of the boats themselves: rusted nails, slats of rotted wood, engine parts, and life jackets. His resulting installation performed the fragmented nature of the journey by bearing witness to the traces of the crossing. It displayed that which cannot be funneled through the official channels, yet which finds a form of care in the curation of Ramzi’s exhibit. These traces were generated by everything that didn’t make it through the chokepoints of the port and the sbarco, and that created a different kind of presence in the form of undetected fragments. Michel de Certeau understood traces as the leftover of histories (1992), things that don’t fit into an official master-narrative of the present (Napolitano 2015). The installation consigns to another order of presence the traces of those who survived the crossing or died. It allows lost and unpaired objects to bear witness to those whose stories of life and death are not documented in the state archive, which translates experience into categories of recognition and erases the traces of the shipwrecks. 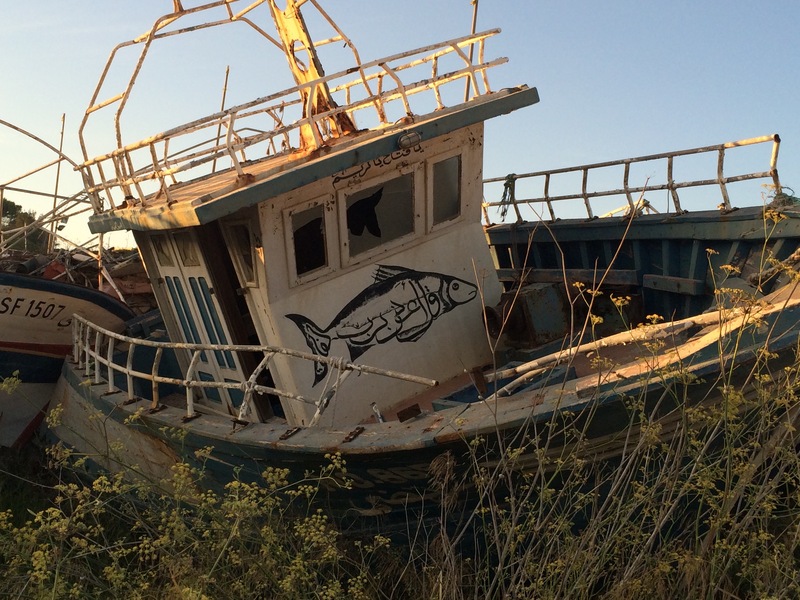 Ramzi’s assemblage becomes a different kind of harbor, of point of arrival for the dead. Like the sbarco, the installation engages the political demarcation of friend/enemy. Unlike the sbarco, though, Ramzi’s art consigns the lost objects to an order different from the law, reinscribing that which exceeds the funnel (the dead and the lawless) within the order of existence. de Certeau, Michel. 1992. The Mystic Fable. Chicago: University of Chicago Press. Giordano, Cristiana. 2014. Migrants in Translation. Caring and the Logics of Difference in Contemporary Italy. Berkeley: University of California Press. Napolitano, Valentina. 2015. “Anthropology and Traces.” Anthropological Theory, 15(1): 47–67.